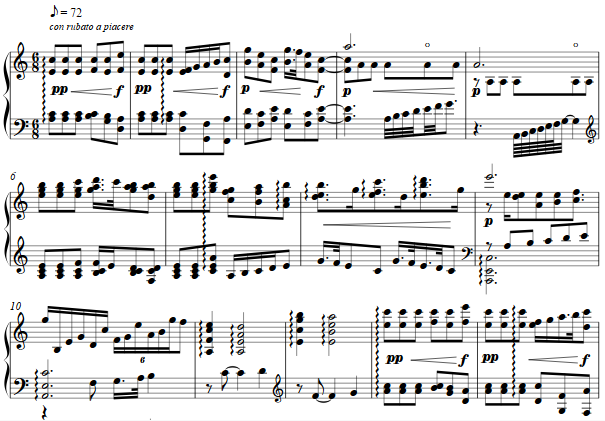 A harmonic progression found in Charles Tournemire's first of Douze Préludes-Poèmes, opus 58 composed for piano in 1931-32, struck my fancy, and excerpting it as theme for a short solo work for harp to further examine it was the next step, especially given the decided difference between the piano and its easily reached chromatic colors as explored by Tournemire and the constraints -- and specific opportunities -- which the harp brings. The progression in A minor which appears at the Meno of the wondrously chromatic prelude becomes the "chorale" with simple variations, one of which being a harmonic alteration for the scale which the seven strings of the harp creates so easily with pedal adjustments, as at measure 29 and thereafter. Dynamic changes the emphasize the end of measures points out the progression's progress.